Here is an extremely simple, raw, yet delicious and healthy drink you can prepare in a minute or so! It's a favorite of mine that I call the banana nut drink. All you need are three ingredients: bananas, coconut water, and walnuts. A whole Thai coconut, four bananas, and four walnuts will make four glass servings. Brown coconuts contain less water so you will need at least two or three of those. Organic bananas are sweeter than the conventional kind. Directions: Cut or break up your bananas and put them into a blender. Add the walnut pieces and then the coconut water and blend to a liquid at medium to high speed. You can control the creaminess by adding less water or more bananas. Add a pear or other fruit or kinds of nuts for variation. Serve into a glass or bowl. Delicious! Tastes kind of chocolatey! 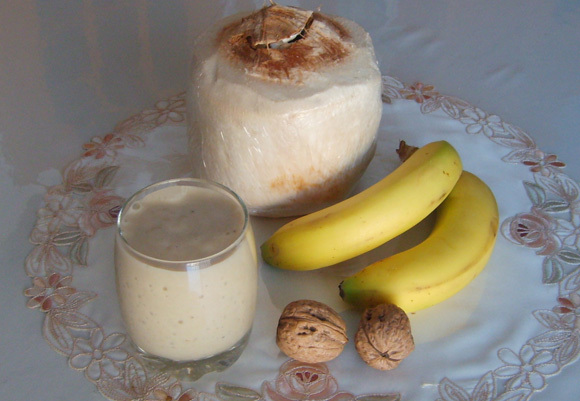 The banana nut drink makes an excellent breakfast or snack and is entirely natural and good for you. Cheers! Note: Originally, the banana was a vegetable and full of seeds, but over the centuries it has been hybridized into a fruit-like state. Farmers and scientists hybridize fruits or vegetables to make them sweeter and more edible. Seedless fruit are a primary indicator of hybridization. This process, however, has its drawbacks. Not only must the fruit be reproduced with the help of man, else it would dissapear, but the oversweetness can contribute to conditions like diabetes and osteoporosis -so eat in moderation.